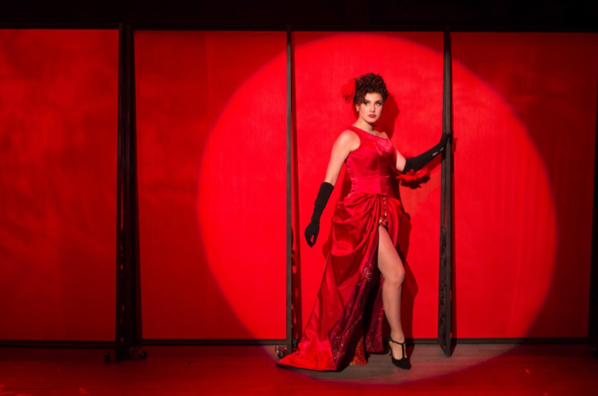 Louise (Maria Rizzo) becomes Gypsy Rose Lee in the musical “Gypsy.” – Photo by Teresa Wood. When lyricist Stephen Sondheim and composer Jule Styne’s original production of Gypsy hit Broadway in 1959 I witnessed Ethel Merman play Rose, a role that many said was tailor made for her and her alone. But though the show has been through many incarnations and Rose has been performed by some of the finest performers who have ever graced the Great White Way, today is another day, and we are lucky to have Sherri L. Edelen, a local actress who also seems to have been born to play the role of the stage mother. Wikipedia defines a stage mother as an “individual prone to obnoxiously demanding special treatment for her child, or suggesting that the individual has placed inappropriate pressure on her child to succeed. Some believe that a ‘stage mom’ is vicariously living out her own dreams through her child.” That the tradition lives on (ponder the current TLC’s Toddler’s and Tiaras) is indisputable. That after all these years it is still being played out in families around the world is undeniable. I should know. As a child descended from three generations of show business, we are quite familiar with the role. 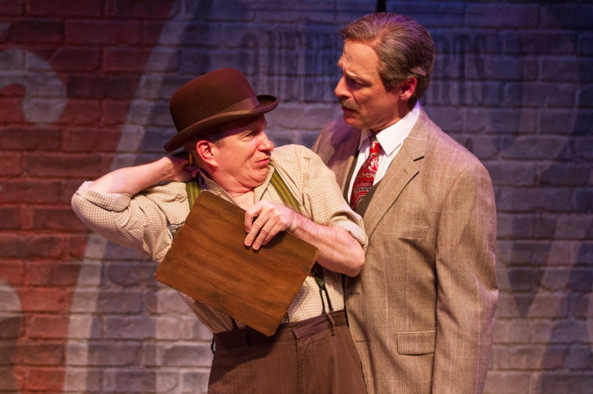 In Signature Theatre’s current production of Gypsy Director Joe Calarco has breathed new life into author Arthur Laurent’s classic backstage saga. His interpretation has been infused with so much talent, heart and energy, it’s happily bursting at the seams. Let’s start with the cast. And what a stupendous cast it is, chock-a-block with powerhouse voices and dazzling dancers. There’s Sherri L. Edelen as Rose, Mitchell Hebert as Herbie, Maria Rizzo as Gypsy, Erin Cearlock as Baby June, Nicole Mangi as grown up June, Sandy Bainum as Tessie Tura the stripper with a heart of gold, Tracy Lynn Olivera as Electra, Carolyn Cole as Renee aka Agnes, Donna Migliaccio as Mazeppa, plus twelve other actor/dancer/singers that make up this delicious cast. If you know musical theatre in our area you probably know most of these performers and their reputations as some of the best in the biz. 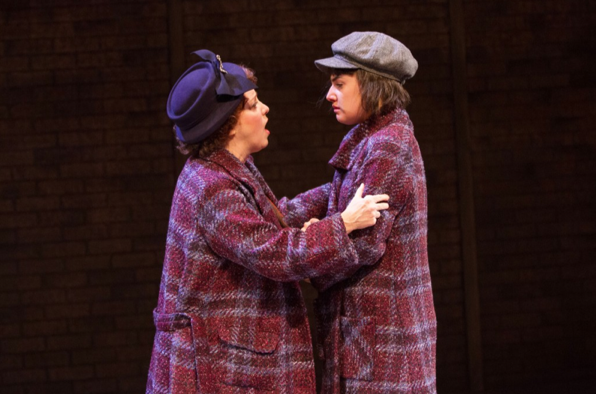 Momma Rose (Sherri L. Edelen, left) places her bets on daughter Louise (Maria Rizzo) – Photo by Teresa Wood. Herbie (Mitchell Hébert, right) makes a point clear to Pastey (Steven Cupo) backstage in the musical “Gypsy,” – Photo by Teresa Wood. It’s the peak of Vaudeville’s heyday when Rose meets Herbie, a onetime talent agent, now traveling salesman. Together they become a formidable duo devising a child act with June, Louise and a couple of stray boys they find along the way. June is the star of the kiddie act, a precocious child with blonde ringlets and a megawatt smile who begins to tire of being forced to play the perpetual child by her desperate mother. “As long as I have this act, no one is over 12!” Rose admonishes. Lighting designer Chris Lee manages the aging process with the clever use of strobe lighting to “magically” switch out the children to older actors during a frenetic dance routine. Unfortunately I can’t say the same for the dozens of set changes in which stage-height fabric panels printed with Vaudeville era advertisements are moved from front to back and side to side throughout the show. It is distracting and awkward even though the quite visible “stagehands” are dressed in period clothing. After awhile you come to expect it, though it doesn’t seem like the smoothest way to transition scenes. 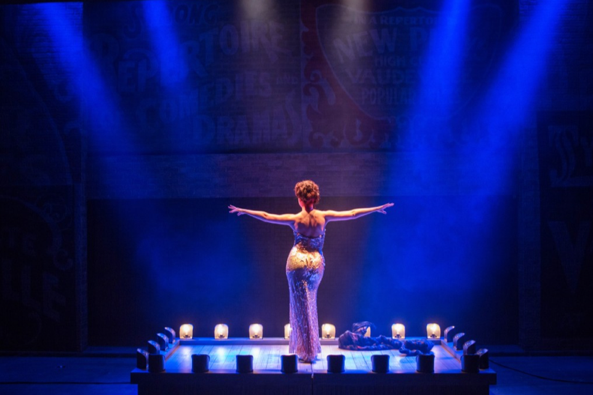 In Act Two the action really heats up when Louise takes a job at Minsky’s, a notable New York burlesque house where she becomes Gypsy Rose Lee, who was in reality the highest paid stripper in history. Louise (Maria Rizzo) sings “Let Me Entertain You” in the musical “Gypsy.” – Photo by Teresa Wood. Through January 26th at Signature Theatre (Shirlington Village), 4200 Campbell Avenue, Arlington, VA 22206. For tickets and information call 703 820-9771 or visit www.signature-theatre.org.